This is a warming, hearty recipe that is perfect for autumn. Spaetzle are German noodles which are usually boiled or pan fried and served with a main dish. This recipe was inspired by a meal eaten in Berlin and I have used readymade spaetzle however you can easily find recipes online if you have time to give it a go. You can also add some smoked ham into the base of the stew if you like. If you can’t get hold of bratwurst then any good quality sausage will work well. 1. Get going by taking a large pan and heating a glug of oil over a medium heat. Cook the onion and garlic for a few minutes before adding in the carrot, celery and ham (if using). Stir through the lentils so they get a light coating of the onions and garlic. 2. Pop in the stock, vinegar and a couple of bay leaves and bring to the boil. I added 400ml of the stock to start with and reserved the rest and added little by little as some lentils are much more absorbent than others to judge it as you go. I always make more stock than I think I need just in case! Lower the heat, season well, cover loosley and simmer for around 30-40 minutes until the lentils are tender and the liquid is reducing but some still remains for the next step. 3. Just before the lentil stew is ready, cook the bratwurst as you wish. Bratwurst can be boiled, grilled or fried so pick the cooking method of your choice! To finish off, you need to pan fry the spaetzle for a couple of minutes until cooked through. Serve the spaetzle and lentil stew with a sprinkle of parsley, with the bratwurst on the side and tuck in! Of course, you can also chunk the sausage and toss that through the lentils if you like. 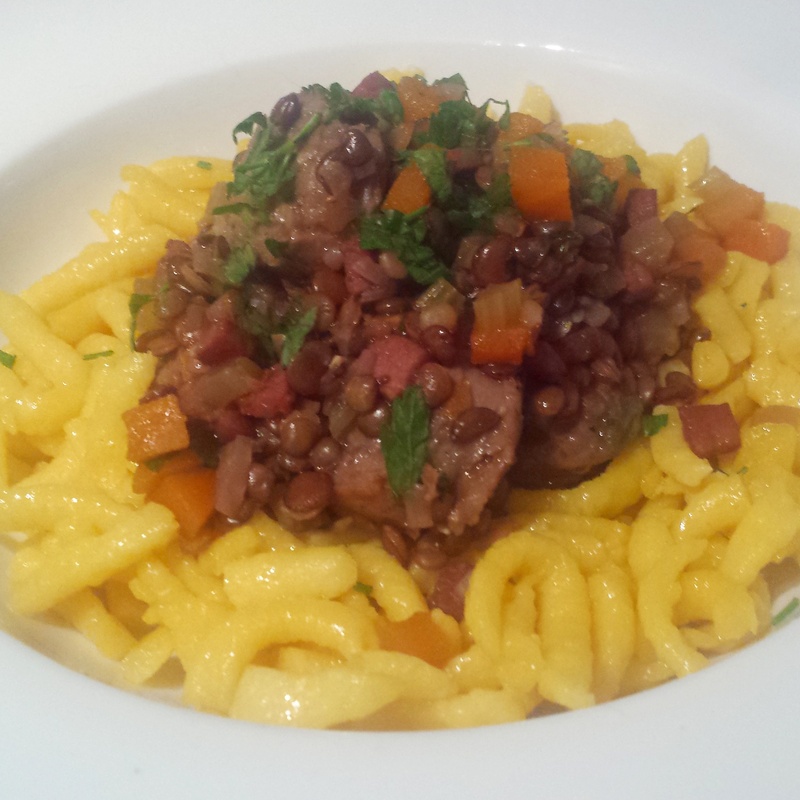 Lentil and spaetzle stew with bratwurst- a tasty take on a German classic!